A £265m project to upgrade a stretch of the M6 to a smart motorway between Crewe and Knutsford has been completed. A fourth lane has been built in each direction with new signage, traffic sensors and CCTV cameras to help tackle congestion for the 120,000 drivers who use it each day, Highways England said. Smart motorways operate variable speed limits to improve journey times. Highways England said it was "the biggest upgrade to the M6 since it opened in Cheshire about 60 years ago". 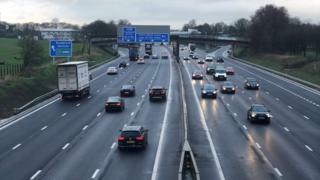 The upgrade on the 19-mile stretch is the first of four smart motorway schemes to be finished that will increase the M6's capacity by a third on 60 miles of the motorway between Coventry and Wigan, Highways England said. Chief executive Jim O'Sullivan said: "Tens of thousands of drivers travel on the M6 between Crewe and Knutsford each day making it one of the busiest stretches of motorway in the country, so the extra lanes and new technology will help make the M6 fit for the future. "The new overhead electronic signs will provide drivers with live information about their journeys, including changes in the speed limit, lane closures and incidents on the route. Traffic sensors at the side of the motorway will also be used to automatically set variable speed limits to keep traffic moving." Other improvements that have been carried out as part of the scheme include resurfacing with a low-noise road surface, installing a new concrete safety barrier to reduce the risk of vehicles crossing on to the opposite carriageway in collisions, and fitting 700m of barriers to reduce noise levels for people living close to the motorway.